The selfie, the best or the worst of technology – depending on who you’re speaking to. But selfies aren’t just about grainy shots of you with a few friends in a dark bar, or a chance selfie with a celeb you bumped into in the street. A selfie can be sophisticated and even cool, if the subject is right and the conditions are used well. 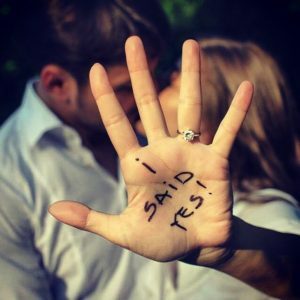 For an engagement ring selfie, it’s all about making the ring look good, so here are our tips for taking an awesome selfie that you may not even be in. Well, apart from your hand, that is. When you see professionally taken product images of any kind, it’s not just luck that makes the entire shot look so pristine, and the selfie of your ring shouldn’t be treated any differently. Clean and neat nails are essential, polished if you absolutely must but your nails aren’t the focus here. Make sure you are well hydrated so that your fingers don’t appear puffy, and moisturize just to make sure they really look their best. If you like, have a manicure, it’s always nice to feel special, and you deserve it! In all photography, light is king. With a photo of something that is specifically designed to use light to look its best, it goes a huge step further. Modern diamonds are cut to maximize the reflective properties, and to use every ounce of the light that enters it. Even antique diamonds were cut to utilize the light available at the time and, after a century of things being done this way, it’s only right that you should use the skills of the diamond cutter to make your ring look as good as it possibly can. If possible, go outdoors on a bright day. Ordinarily, harsh sunlight is a photographer’s enemy, but it can help to turn an already great diamond into something special. Watch for shadows from either your hand or anything else that may encroach into the frame, and play with different angles to see which best suits the direction of the light. If outdoors is not an option, use a window to provide as much light as you can. Forget about taking the picture when it’s dark, hoping the woefully inadequate camera flash on the phone will do the job. It won’t. Important Tip: Using the flash indoors will almost always destroy your picture. Although your engagement ring is the obvious star, don’t be afraid of getting creative with the angle and background that you use. Try both complementing and contrasting backgrounds to see which looks best. Your skin tone, as well as your ring, will be a factor here, so don’t be scared of taking your time to make sure it’s just right. A close shot with a narrow background view or a big, wide-open shot with your hand close up to the camera are both possibilities, as are a plain material or a view of a mountain. There are no rules in play here, except for getting the shot right. Ring shots that show a hand with fingers rigidly sticking out are rarely flattering. Relax your hand a little, and rest it on something if that’s the type of picture you want. It’s well established that people react differently to pictures they see that show a relaxed situation than when one conveys tension, regardless of the level or cause of that tension. Also think about tilting your hand slightly. Light can expose as well as hide things, so pick a viewpoint which minimises skin flaws or other things that, whilst a part of who you are, don’t need emphasising. Selfies come from smartphones, we all know that, but we’re not talking about a snapshot here, we’re talking about a picture of one of the most important things you will ever own. Don’t be afraid to use a digital camera, better still if you have a friend who knows how to use one properly. At the end of the day, nobody will care how you took the picture, they’ll just care how good your ring looks, so feel free to cheat a little. Every great photo you’ve ever seen has been edited after the event. Now, we routinely use the word “Photoshopped”, but all Photoshop does is replicate digitally the techniques that have been around as long as photographs have existed. This, again, might need a little help from someone who knows their way around editing software. If you’re using a smartphone, the camera app will usually have pre-set edits that you can click to improve the image. Try and stay away from filters, if you can, though. You’re not making a cartoon. Digital photography means we no longer need to have concerns about the cost of film or its development, so feel free to take as many pictures as you want, safe in the knowledge that you’re bound to get at least one that works. Try different angles, different backgrounds, different just about anything. Take hundreds of pictures if you wish, but only share the very best one. You’re not creating a gallery, you’re taking a selfie. It doesn’t matter how planned the process has been, or how much work went into the shooting or the editing, you’re really here to manufacture spontaneity. And if that worries you, don’t let it. Truly, nobody else will care about how you got the picture to be so good, just that it is.